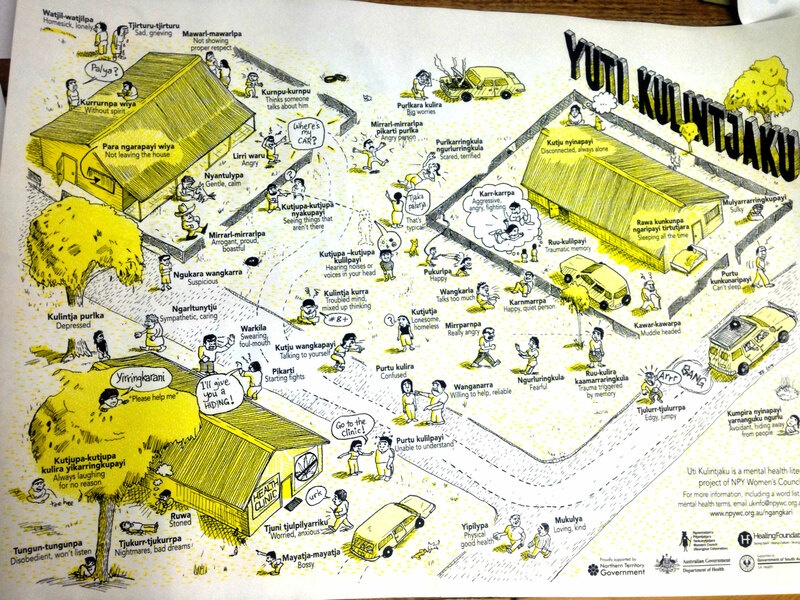 This was a ripper of a project that I illustrated for earlier this year for NPY women’s council. I worked with designer Elliat Rich (who lives in Alice Springs) to come up with this poster in consultation with a group of ladies from NPYWC. It was translated into 2 languages – Pitantjatjara and Ngaanyatjarra – and attempts to use existing words from those languages to discuss concepts around mental illness, feelings and behaviours rather than bring in English language words. A very interesting project to draw. And the poster has apparently had a great reception. We’re doing a second poster about child development – it’s in the pipeline. Artist and musician Olivia Webb reworks video of simple, natural environments to complement and build upon Meek’s soundscapes. Webb’s videos play with elemental themes, an obsession with weather patterns, and ideas of irrational symmetry. Images morph as the sound pulses creating one holistic/universal experience for the audience. I have read Meanjin on and off for many years – in my opinion it has had periods of being the best of the Aussie literary magazines. 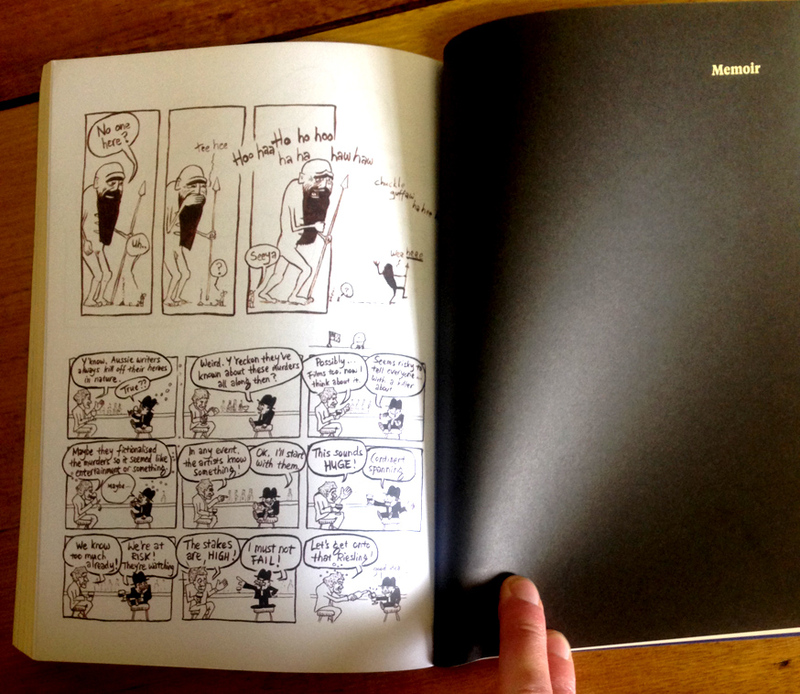 It has even had periods of having comics in it which were quite notable. In particular Elizabeth Fielding(et al)’s fantastic series Their Hooks Find Hold Deep in Our Flesh which ran through several issues between 2008 and 2009, which I make mention of in this review for Island Magazine’s website this year. SO – I was particularly chuffed to be asked by Meanjin’s incumbent editor Zora Sanders to create something for the print magazine this year. It’s always nice to allowed a fair bit of a creative freedom too … I’ve been doing a fair bit of illustration lately so it was VERY refreshing to find an outlet for the zillions of ideas that I have buzzing around my scalp. 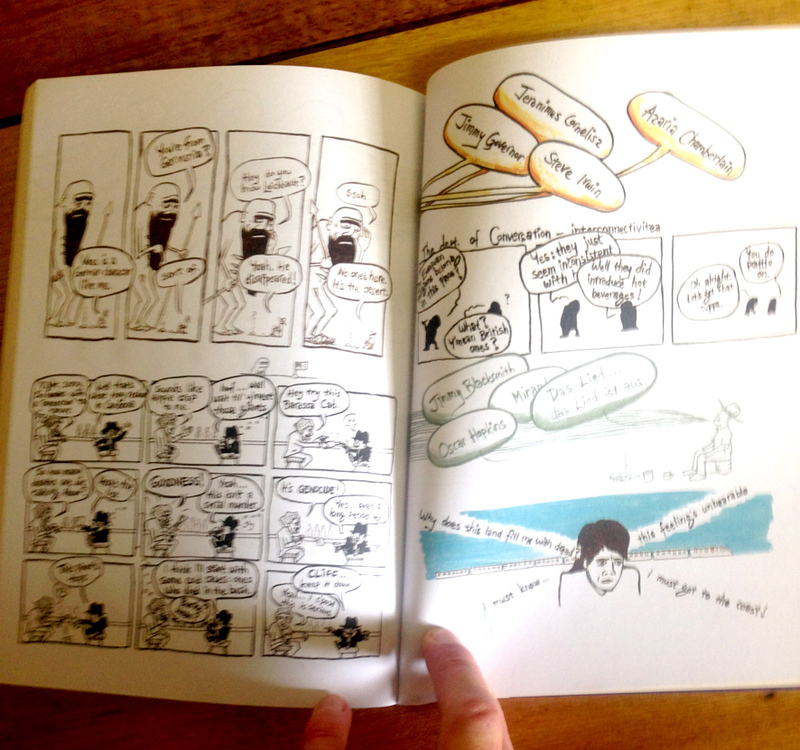 Sleuth is an ongoing series of rambling, intersecting comics that began in 2012 with the Hobart exhibition. In 2014 it has enjoyed a fair bit of exposure – this being its 3rd outing. The first of 2014 was in April, with the exhibition Sleuth: the Delegation held at Sawtooth ARI in Launceston. 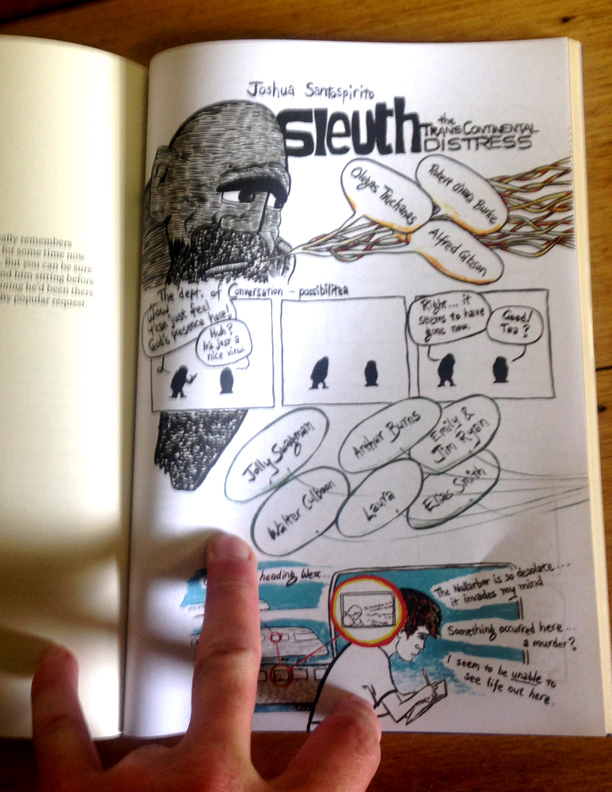 Sleuth: OMG was a 4 page comic published in June of this year in Island #137. And today! I receive in the post – the printed copy of the Spring issue of Meanjin Quarterly – which has published my 6 page mega-complex Sleuth: The Transcontinental Distress. Here’s some pics – not really for reading, it was designed for reading specifically in book form – the page turns are crucial to the understanding the mess and confusing layout of this piece. It will probably never work properly in reading on the screen. It was really fun to write and layout and makes reference to fictional characters that have died in the Australian landscape, as well as real human beings that have died in the Aussie landscape … and how they have BOTH become mythologised. 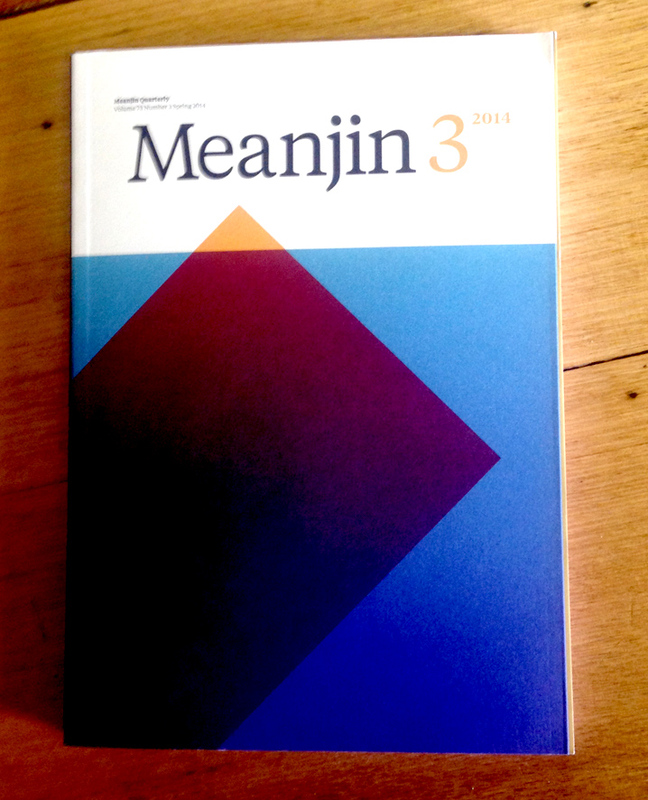 Also – my really good friend, and excellent writer Jennifer Mills has a piece in this issue of Meanjin. I recommend you all find an Aussie literary magazine or two! And then subscribe to them forever. I will do my best to continue to encourage them to ALWAYS include comics … because, let’s face it – comics belong in the literary fold.